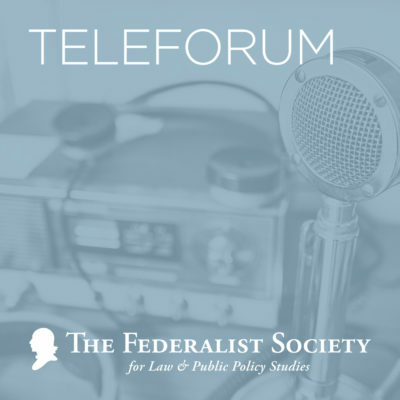 This series of podcasts features experts who analyze the latest developments in the legal and policy world. The podcasts are in the form of monologues, podcast debates or panel discussions and vary in length. The Federalist Society takes no position on particular legal or public policy issues; all expressions of opinion are those of the speakers. We hope these broadcasts, like all of our programming, will serve to stimulate discussion and further exchange regarding important current legal issues. The Texas Tech Medical School recently approved an agreement with the United States Department of Education’s Office for Civil Rights, to end the use of racial preferences in their admissions process. The agreement was reached after over a decade of negotiation, initiated by a complaint filed by the Center for Equal Opportunity against Texas Tech in 2004. The agreement is a promising sign for opponents of racial preferencing in school admissions process, and could have significant implications for the future. On the morning of March 27, the Supreme Court heard oral argument in Kisor v. Wilkie. The Supreme Court granted certiorari in Kisor to decide whether to overrule Bowles v. Seminole Rock & Sand Co., 325 U.S. 410 (1945), and Auer v. Robbins, 519 U.S. 452 (1997). Seminole Rock and Auer are often cited for the proposition that when an administrative agency promulgates a regulation and the regulation is ambiguous, a reviewing court must give “controlling weight” to the agency’s interpretation of the regulation unless the interpretation is plainly erroneous or is inconsistent with the regulation. A number of the Court’s members have cast doubt on the soundness of the Seminole Rock/Auer deference doctrine in recent years. Many observers believe that the doctrine’s days are numbered. Importantly, the United States filed a merits brief in Kisor that forcefully criticized Auer/Seminole Rock deference, yet argued that the Court should not overrule Auer and Seminole Rock “in their entirety.” The brief foreshadows what will likely be a memorable oral argument, featuring Paul Hughes of Mayer Brown LLP and Solicitor General Noel Francisco. Hughes represents James Kisor, the Vietnam War veteran who is the petitioner in the case. Kisor is challenging a decision of the Department of Veterans Affairs (VA) that denied Kisor’s request for retroactive disability benefits connected to his wartime service. Francisco will be defending the VA’s decision. What is the nature of government involvement in religious matters, and what is the future of crosses used in war memorials? On February 27, the Supreme Court will hear consolidated oral arguments for two cases concerning World War I crosses: American Legion v. American Humanist Association and Maryland-National Capital Park and Planning Commission v. American Humanist Association. These cases raise important questions: does the Establishment Clause require the removal of these memorials because they are shaped as religious symbols? Is offense over passive religious display substantive enough to establish standing? Free speech and open inquiry on campus have long been a fundamental part of higher education. However, in recent years public universities have started to enact speech codes and other guidelines. These measures have resulted in several lawsuits filed against the public universities across the country with interesting results. Please join us for a discussion with representatives from the Alliance Defending Freedom, the Foundation for Individual Rights in Education, and SpeechFirst, who all have active litigation related to campus free speech moving through the federal judiciary. Mr. Michael Connolly, Partner, Consovoy McCarthy Park PLLC. In Timbs v. Indiana today, the Supreme Court held that the Eighth Amendment prohibition against excessive fines is incorporated against the states under the Due Process Clause — not the Privilege and Immunities Clause — of the 14th Amendment. In doing so, the Court explicitly rejected Indiana’s argument that a civil forfeiture is not a “fine” and thus its “excessiveness” may not be reviewed. The Court’s ruling has significant implications for the practice of civil forfeiture in the United States, for broader criminal justice policy, and for constitutional interpretation. There has been much in the news lately concerning the President’s use of emergency power to shift budgeted funds from one purpose to another, namely, construction of a barrier along the southern border of the U.S. Does the President have inherent constitutional authority to declare an emergency and move the funds? Has Congress otherwise given the President statutory authority to do so, and, if so, has that authority been granted constitutionally? These and other questions will be debated on our Teleforum conference call.